Books: To E- or not to E-? I love books, and am getting used to the idea that a book isn’t necessarily a physical object. These days, I buy more books made of electrons than books made of dead trees. 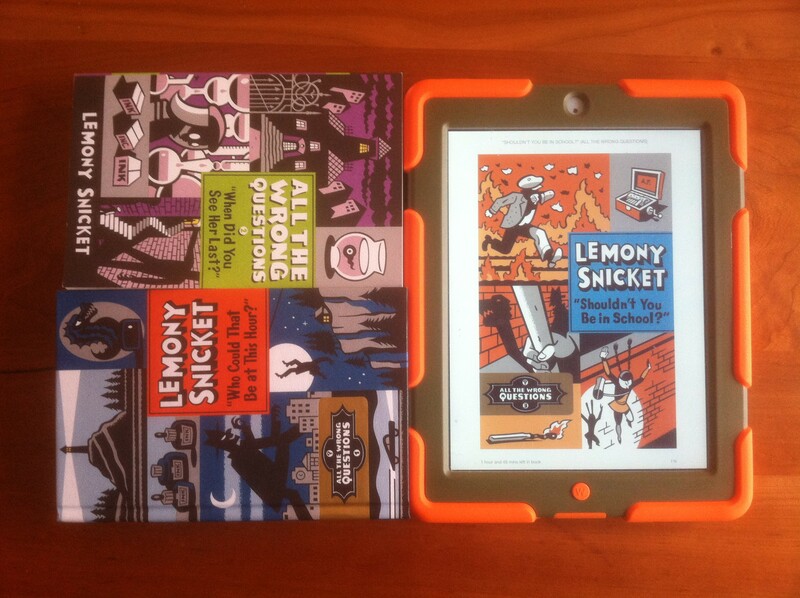 The photo shows the first three books in Lemony Snicket’s current series, All the Wrong Questions. Each is in different form. Who Could That Be at This Hour? I have in hardback. I’d been meaning to try out the series for a while. I bought this particular edition because it was only $4 at a book fair at my kids’s school. Reading it made me want more books in the series, preferably in dead tree form. Although this is not a long book, this is a pleasingly chunky volume, with apt illustrations by Seth. When Did You See Her Last? I have in paperback. I bought it from Amazon, where the paperback edition was $7 , and the Kindle edition only 35c cheaper. Still I wanted more. Shouldn’t You Be in School? I have as an ebook: on Kindle , to be specific. That edition was only $2 when I bought it (it now, a couple of weeks later, $4). I did have some concerns that the illustrations wouldn’t work as well on a tablet’s screen, but the cover and other illustrations show pretty well, I think. As you can see, price sways me toward ebooks, but a lower ebook price doesn’t always defeat dead trees. But sometimes time defeats dead trees: a download takes seconds, rather than the hours or days involved in dead tree pickup or delivery. Sometimes ebooks win because they don’t take up shelf space, or gather dust. How do you make the decisions between the ebooks and dead tree books? Author andrewPosted on December 14, 2014 Categories Fun, UncategorizedTags book, ebook, kindle, lemonysnicketLeave a comment on Books: To E- or not to E-? To Sell is Human (TSIH) is a four-star book compared to other books by the same author, and to other books about the same thing. Now, what is TSIH about? The answer, obvious from the title, is: selling. It is less obvious from the title that this is a book, not only about sales, but also about “non-sales selling”. So non-sales selling is very similar to influence, and Dan Pink’s To Sell Is Human shares its subject with Influence: Robert Cialdini’s classic account of the psychology of persuasion. Dan is explicit about his knowledge of, and respect for, the earlier book, especially in his chapter on clarity: Influence tops his list of favorite books on the subject. Dan’s judgment is sound: if I were to recommend one book on non-sales selling, it would be Influence (rather than TSIH). The contrast with Influence may be more harsh than it is fair: TSIH does in some ways go beyond Influence, rather than attempting to go head-to-head with it. Most important, To Sell is Human is a book, not only about non-sales selling, but about sales selling and about change. Selling cars provides a salient example. In the past, the seller was much better informed that the buyer. That information asymmetry has been eroded over time, particularly by the internet. Dan argues that it is now better business, as well as better ethics, to sell based on empathy with the buyer than to attempt to exploit the (potentially well-informed) buyer. However, sales selling and non-sales selling seem like strange bedfellows, or bookfellows: they don’t fit into the same book as naturally as they perhaps should. This is one of the reasons why To Sell Is Human isn’t in the same five-star class as Influence, and some of Dan’s other books. I could list a few other reasons, but none is major, and it’s time for a shift toward the positive. TSIH is very much a Dan Pink book, with all the good things that implies. Dan explains convincingly why his subject is interesting and important. He makes each topic engaging with practical examples, draws on and clearly explains relevant research, and provides practical implications. It sounds easy, and Dan’s books make it look easy, but many similar (i.e. popular social science) books end up being superficial, stodgy, or both. TSIH does not need to be pushed off a bookshelf by Influence and by Dan’s other books, however much this review might have so far put it up against those strong competitors. TSIH complements those other books as much as it competes with them. For example, Influence’s Epilogue warns of the threats lurking in an environment rich in content, when much of that content comprises attempts to influence us, and many of those attempts are deceptive or worse. TSIH is very much about the content-rich environment, but is more positive, and not just because this environment provides buyers with information previously reserved for sellers. The very volume of content provides opportunities for curation: to select from the abundant content, to share the selection, and thus to add value. With TSIH, Dan also complements his best book: Drive. Drive is about motivation: what drives us. TSIH is about how we can move others. There can be few aspects of psychology as important, or as mutually complementary, as what drives us, and how we can move others. One last complement is Dan’s website, since it complements his books well. 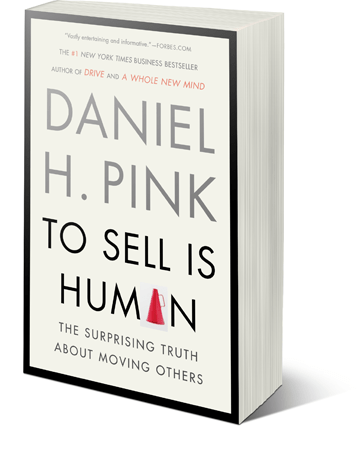 One last compliment: To Sell Is Human is a very good book, and one that I might perceive to be even better were it not for the comparisons invited by a Dan Pink book about influence. Three years ago, I received a review copy of Groundswell, the book about “social technologies” by Charlene Li and Josh Bernoff. I was very impressed by it, as my review post shows. I see from Charlene’s blog that a paperback edition is now available. There are a couple of new chapters. One is about “social maturity”, on which Josh posted recently. Books are sadly limited things once they are wrapped in DRM (see previous). Now even the word book may be limited. I don’t think that’s satire. I think that Jennifer Van Grove wrote it for Mashable with a straight keyboard. The hounds of “intellectual property” have made enough toothmarks on enough books. Now their foul fangs slaver for the word book itself. Author andrewPosted on August 20, 2010 Categories Business, UncategorizedTags ads, book, ebook, freemium2 Comments on Freemium, Ad-Supported Books?